These newest sculptures focus on travels through the underworld, as well as transformation. I have 2 sculptures that are Persephone, the Queen of the Underworld – as well as a delicate creature that has slithered along to encounter the river of Lethe, desperately looking for a way to let go of their humanity and move forward into the afterlife. Expressing decay in doll form has been a recent interest through the use of burned plastics and exposed wire armature (the “skeleton” of dolls). 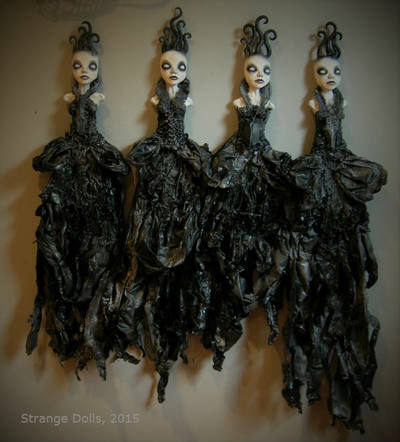 These dolls are made from wire, rubber, plastics, cheesecloth, Puppen Fimo polymer clay, and plaster. Each piece is available through my etsy shop. The obsession with creating decay in these creatures has led me on a new journey of getting involved with new technologies – the 3D pen. The pen extrudes a thread of ABS plastic so you can, literally, draw a sculpture. For anyone who has tried it, it has its challenges but I am really excited to share the creations I have made with this new technology (see photo below). They have been described as a witchy nervous system. I hope that you will enjoy them as much as I have enjoyed creating them! I have a few new things ready for the holidays: ghoulish christmas ornaments, medusa-like magnets for stocking stuffers, and a macabre christmas tree topper. You can check out all the goods on my etsy shop. Had such a nice visit to A Little Twisted this weekend. I dropped off work to sell in their shop, fell in love with Robert Kennedy’s taxidermy art, had a spirited chat with the owner, got a tour of their metal/glass/wood shop, and watched a gorgeous sunset in the tiny town of Brandon, VT. This shop is one of those roadside attractions you do not want to miss. Even though the gallery is small, the artwork selection is awesome for folks who love outsider art, dark art, geekdom, etc. Sorry for all ‘ums’ and ‘hms’, my brain was completely frazzled after 2 crazy months of events and vending, the huge success of the Art of Horror opening night (and all the prep that went into it) and the annoyance of the Mixed Emotions show cancellation and the new found home for it at One Arts. After the interview I promptly got on a plane and took off to the Dominican Republic for a MUCH NEEDED week long vacation amongst Dr. Seuss like palm trees, beautiful flowers, funny birds, and glory of the Caribbean. I did nothing for a week but drink cocktails, listen to music, read voraciously, and doze on the beach, under the stars. Guess it is time to get back in the studio and get to work. Who wants to be outside? 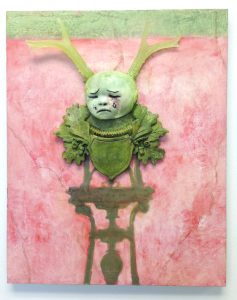 Join us for a closing reception, artist talk, and Halloween party Friday, Oct 23rd from 6-8pm. Costume it up! This show explores the beautiful and sublime and revels in a balance between underlying feelings of unease and open expressions of strong emotion. Come and decide for yourself if you are creeped out. This exhibition was deemed so disturbing it was removed from its previous exhibition venue. The work is on display through the 31st. 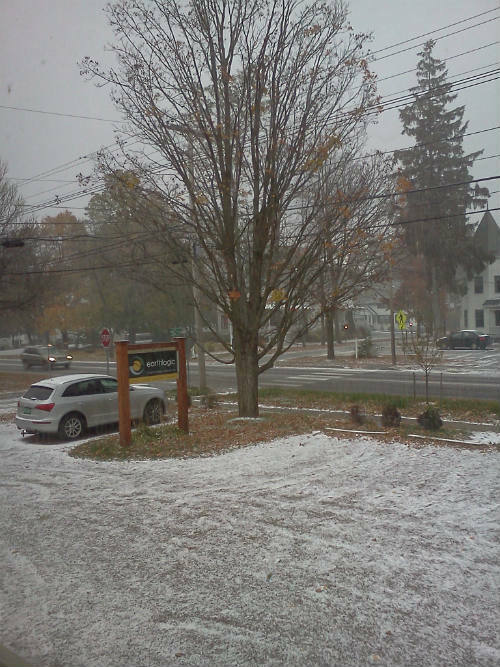 ONE Arts​ open hours are Saturdays and Sundays from noon until five. Fall in Vermont is an extremely hectic time of year as we try to cram in as many activities, events, and experiences before we all head indoors for winter. This year is no exception in the land of Strange Dolls. I hope you can add me to your own hectic list of events so you can snap up some creepy little dolls and jewelry and see some of the sculptures I have been working on for exhibitions at S.P.A.C.E. Gallery and the One Arts Center. Each year Sarah Vogelsang-Card and I curate a dark art event called “The Art of Horror”. You are invited to kick off the Halloween season at our opening reception on October 2 from 5 – 11pm. Costumes are highly encouraged. For one night only, indulge your senses with dark imagery from Vermont artists and spirit conjuring performance art. Top off the night (from 9 – 11pm) with live music by Burlington’s only Goth/Industrial band Nechromancer. Suggested donation: $5 at the door. This event is not recommended for children but is open to the general public. You can now catch the show that was up for ONE HOUR at Burlington Beer Company, before being asked to remove it. 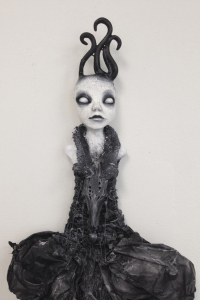 This exhibition of dark doll work with Catherine Hall has moved to the One Arts. Many thanks to curator, Margaret Coleman, for providing an exhibition space and place to discuss censorship in the arts.